You Can Be Whatever You Wish – TAKEN ACTION NOW! I went to my second REAPS (Real Estate Association of Puget Sound) meeting this past Sat. It was a whole day event featuring Mr. Louis “Lou”Brown. To be honest, I did not feel I learned much on the “premier” public event on Thursday night where Lou gave a brief introduction on himself and his products. But I knew there is always something I do not know and what we need now is open up ourselves to different business models. Thus I set my alarm to 6am, and start driving at 7am. Most of the time, volunteers for campaigns become active in politics during college, but in one local election, a volunteer is starting much sooner. When a political candidate has little political experience, everyone around her has something to add, some experience to share, or some intangible to help the campaign. What Joyce didn’t know is that her next volunteer didn’t drive, couldn’t vote, and stood as tall as her elbow. She bumped into a neighborhood kid, Zev Dickstein, an 11-year-old 5th grader. 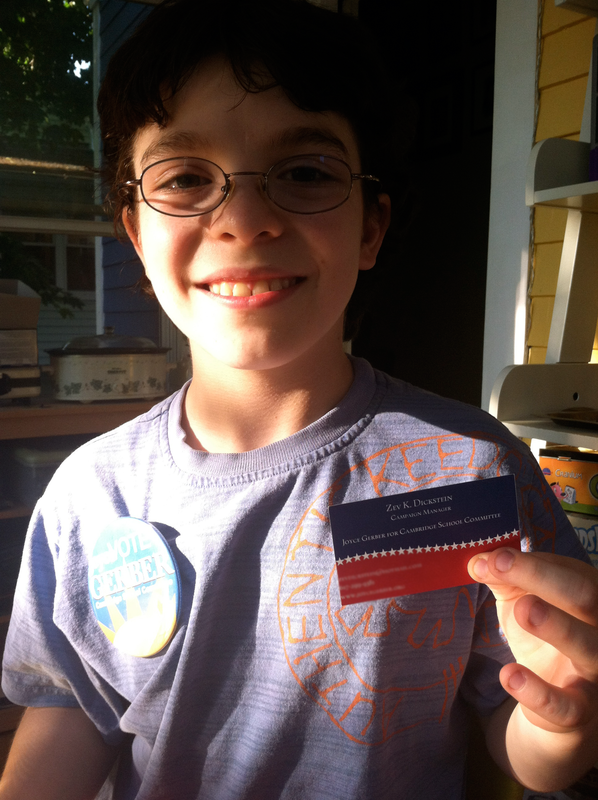 Zev is a political wonk beyond his years, whom Gerber had met volunteering for Elizabeth Warren’s campaign. “We had a little discussion, we had a policy discussion. And he sent me a very nice email and said he would love to be my campaign manager,” she said. Gerber told him she would talk to his mother, who signed off, and Zev soon began knocking on doors for Joyce’s school committee bid, just as he’d done for Warren’s campaign. Zev said he learned a lot from Warren’s campaign. Summer is a time when most 11-year-olds are in camp, in a pool, or riding their bike to a friend’s house. But Zev has his time management down pat. “I do my violin when I get home, then I work on the computer for Joyce. It’s really busy,” he said. In politics, sometimes you need luck to fall your way. This Sunday, when Zev helps Joyce kick off her campaign at a Cambridge block party. This 11-year-old will also be performing magic tricks. This 11-year-old campaign manager made my morning. It is the type of “motivational injection” that last me a whole week. There I am, sitting in the middle of a whole room of people from all ages. Many of them had already owned more than 5 houses at the moment, some even holds more than 15 properties. On one side, I wish I could understand and absorb as much as they would do, because I know the more you practice, the more you would value continuing education. On the other side, I am so proud of myself perhaps being the 5th youngest person in the room, and I know – WE ARE DOING THIS! Not tomorrow, not next year – TODAY. NOW. Good news, I am closing my very first deal with the help from my wonderful realtor Mrs.RoJane Maybee. Tomorrow is my first inspection, and I already have renters coming to check out the house! 🙂 It’s all happening! I LOVE IT. Please stay in tune, and I would like to share something I learned from Lou last weekend with you shortly.